Compared to the first episode of Shigatsu wa Kimi no Uso, the second episode doesn’t have nearly as much music, probably because they’re building the foundation for Kaori and Arima’s relationship. But they did feature a superbly animated violin sequence using yet another Beethoven piece: his Violin Sonata No. 9, commonly known as the “Kreutzer” Sonata. The piece’s first movement was featured as the piece all of the violinists would have to perform at the Towa Music Competition. In the episode, Arima makes the astute observation that the “Kreutzer” Sonata is an unorthodox choice for the set piece in the first stage of the competition because the piece uses both the violin and piano. In most instances, competition organizers will pick a solo piece to gauge the performer’s ability before having them pair up with someone else in subsequent stages. However, this unusual choice serves as great canvas for showcasing Kaori’s unusual interpretation. In a more practical sense, the “Kreutzer” Sonata works to differentiate the performers because of its distinct sections. The first movement’s reflective, melancholy introduction lingers for almost 2 minutes (see video at 1:48) before the violin launches into a heroic melody that continues to move ferociously while passing dizzying lines with the piano. Around 2:53, the sonata mellows out as a softer theme is introduced. Here, the melody descends into broader phrases which then end abruptly when the piece returns to its previous wild tempo. The violin then heaves its melodic bursts with fervor, marking the theme that ebbs and flows throughout the movement before coming to a roaring finish. With this structure, we can see how the director can cherrypick sections to make Kaori’s performance appear better compared to the other players. When we hear the first performer, he’s playing the section from 5:15 to 5:35 where much of the work is being done by the piano. While he plays accurately and with finesse, he remains conservative with his tempo and dynamic changes, resulting in a clean but ultimately flat sound. This blandness is reinforced as the second and third performers are shown playing the same section of the piece nearly identically to the first performer. The third performer sees his playing time go through to 6:18, but begins to waver in his tempo, misplacing several notes while playing unevenly. 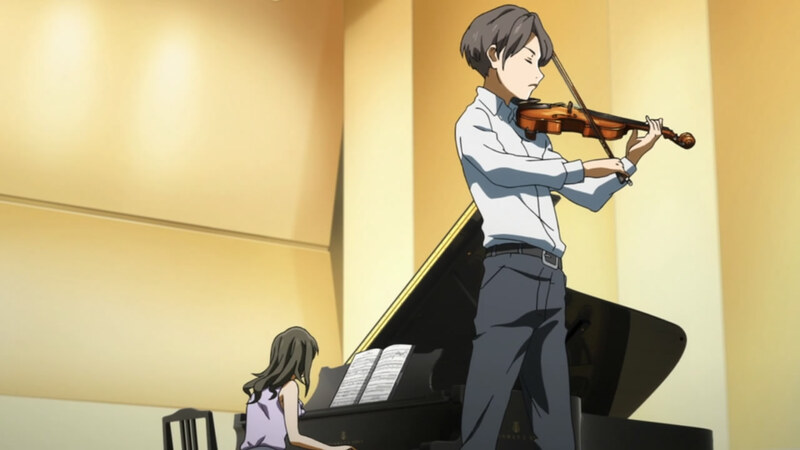 Though the judges write the performance off, Arima empathizes with the violinist who struggles through the piece. It’s also fun to note that the part of the sonata where the performer begins to fumble is a section that develops into a minor key, building with a tension that seems to resonate with the player’s ordeal. When Kaori hits the stage however, the scene has her start from the beginning (0:23) where her delivery is much sharper with the first chord (compared to Joshua Bell’s, anyhow). Immediately, her bright and free playing captivates the audience (albeit exaggeratedly). From there, she skips straight to the spirited section at 1:48, accentuating her chords with plenty of flourish. After finishing up that section with aplomb, Kaori jumps to the part from 3:24 to 4:32. Here, the flurry of notes has her slashing away, then hitting the pizzicato section effortlessly. Finally, she closes the piece off with that fierce ending (10:43 to 10:59), bringing forth a grand spectacle that elicits cheers from the crowd, after a breathless pause. 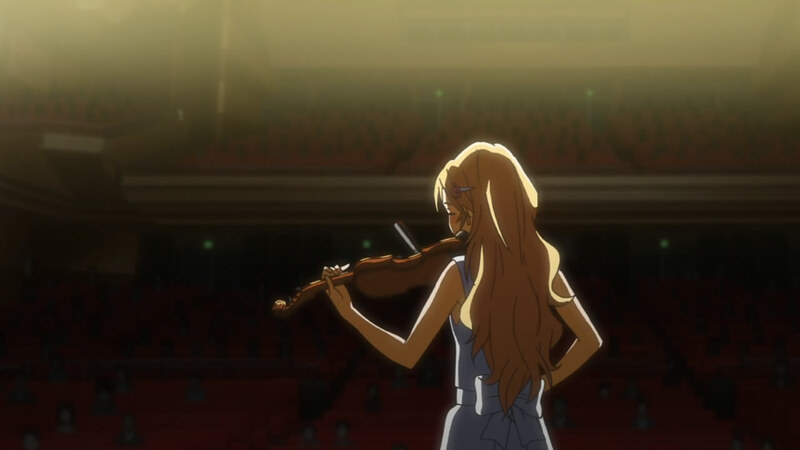 In addition to cherrypicking the more dynamic passages to showcase Kaori’s playing, KimiUso‘s creators put a lot of detail into animating her violin performance instead of using panned stills like they did for the other players. As soon as Kaori begins sauntering through the first chords of the sonata, I was taken aback by the accuracy with which her violin-playing was drawn. From proper finger placements for the notes, to the rocking wrist motion for her vibrato, to her hand position while changing bows, to even her expressive swaying to the music, all of it was masterfully animated in concert with the music itself. As the sonata surged in intensity, so, too, did her facial expressions. As Kaori flew through the sprightly passages, her bow and arm movements blurred with the speed, and as she flourished during the finale, bits of sweat and rosin dust were shown flying around, fully capturing the essence of her performance. As a violinist myself, I couldn’t help but become just as captivated as the audience was while watching this beautifully animated sequence, because it felt as though I were watching Kaori play in person. This contrast in animation, when bolstered by the music selection, elevates Kaori’s performance far above the rest of the competition’s entrants. The level of detail used in this episode was exceptional compared to other shows that involve music, which show only brief glimpses of actual instrument playing to fill the gaps between mostly still scenes, bobbing heads, and long distance shots. And just as Kaori’s put her own stamp upon the sonata, the show also set itself apart with the performance scene. While the head judge in the show could not overlook her breaking from tradition, Kaori created a strong impression on audience and viewers alike. There is no doubt, then, that the question she asked herself earlier about whether or not her music would be able to reach her audience was answered definitively. Another very interesting write-up! Keep em’ coming! I don’t think ep.3 had anything too interesting to write about though really. I guess the brief scene where Arima plays the piano in the cafe. That’s all I remember really. Maybe you could combine ep.3 and ep.4 into one write up? Thank you for this! I was following along with the score, but what I heard clearly didn’t match what I saw. I’m glad I didn’t have to go through the work of piecing it all together, and figuring out what part went where! You are awesome. Please keep writing about every episode of KimiUso. Yup, we’ll definitely do so. Just takes a bit of time to pull all of that research together. Stay tuned! Less obvious was how the lighting, camera angles, and focus on her expression and body language really conveyed things about her character and her relationship with the piece. All this is right in front of our face but in getting caught up in the music, the viewer might not be completely conscious of how these details are effecting the presentation of the scene. I’ve watched this episode a couple of times and never really analyzed it to any degree until now. The music speaks for itself but there’s much more going on than what we hear or what we expect to be watching. Great post that really does this episode justice and gave me a different perspective I hadn’t considered.